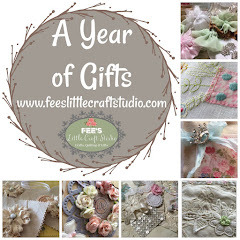 Fee's Little Craft Studio: Welcome Autumn !! The first day of autumn has arrived and it was quite sunny and lovely here at Brighton. We all rose early and headed off to the local market where I purchased some more plants for the garden. 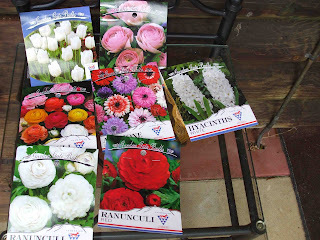 I have also planted all of these lovely spring bulbs today in readiness for spring. I love to see the spring bulbs peek through the soil in August it reminds me that spring is just around the corner. Our pumpkin and carrot seedlings moved out into the big garden today and were given some mulch to help them settle in a little better. 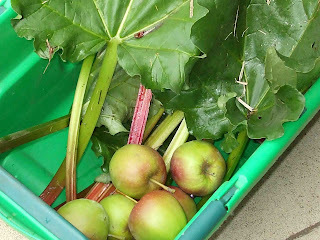 I also harvested some Rhubarb and Apples to make dessert for tonight's dinner which was Rhubarb and Apple Crumble - One of our favourites served with whipped cream. 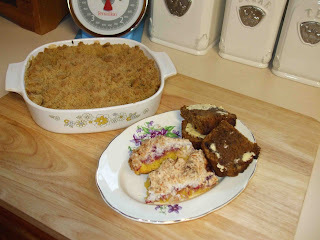 I also made a Date & Walnut Loaf as well as some Raspberry Shortbread made with homemade Raspberry Jam. Look who came to visit last evening ! My chair where I sit and sew is just next to this window and as we were getting ready for bed last night Rod spotted our visitor. We gently removed him and placed him back outside. Hubby had never seen a bat before. We just had to wake the girls to show them - They thought that he was "cool"
The pics at the top are the items that I purchased from an estate garage sale on Saturday. 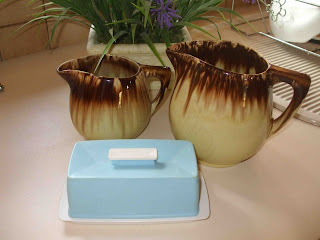 The jugs have no makers mark but are just gorgeous and the little vintage butter dish is very nice also. I hope that you all have a great week !! I just ahave to tell you that one hot night we had a bat cirling under our ceiling fan that was on. It was going around in circles over the bed!It was caught in the lounge the next night and let out. Ewww a bat??? You have been chosen as one of the winners in my Sampler giveaway!!! Could u please email me your snail mail address so I can pop them in the post for you!! Thanks for entering! Hey fiona! from the first pic I thought it was a mouse!! 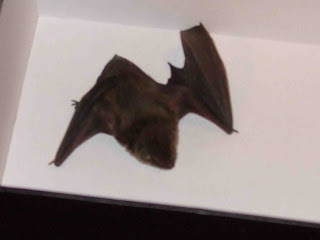 I have never seen a real bat beofre either!! 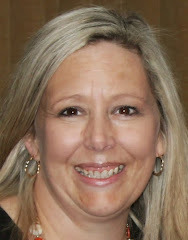 Hi Fiona ~ thanks for taking time to drop on over at my blog and say g'day...I really appreciate it. Your home and blog are both really wonderful and I see we have a lot in common. 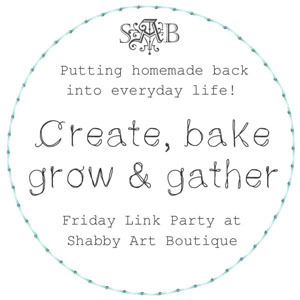 I love gardening too, but unfortunately have been neglecting it a bit lately, there is always so much to do! Growing fruit, vegies and herbs gives me such a buzz, and I noticed that you froze some of your herbs...I must do that to, is it straightforward? That little bat visitor is quite cute. I'm originally from Darwin and can say that the bats there are huge and definitely not cute! Your little grandson is a sweetie, and you all must be so excited about the new bub on the way. Hope you have a lovely evening and I look forward to visiting again soon. p.s. I've put a link in my post for a zip tutorial, after your question on my pouch post. dear fiona..found your blog via another aussie blog..! I would love to be able to buy some seeds to plant...but with the weather in melb..where it NEVER RAINS..it is not possible..my garden is "CACTUS"..
saw heaps of bats flying around my sons house on the gold coast yesterday (back in melb now)..
Not so sure about the bat though - makes my skin crawl just thinking about it. I love your blog - your grandson is gorgeous. I can imagine how much he must be enjoying the chooks. Not sure about the bat though - in Sydney they just seem to poo on the car and make terrible noises. They are bigger too. We've had a few bats in our house that came down the chimney. They area fascinating creatures. I'm glad you didn't hurt him. What an amazing visitor to have. You know I hadn't even thought about the fact that it is Autumn now. Your bulbs are going to look great. I have a collection of them and forget to put them in the ground. I love your little treasures for the garage sale. I could do with a jug of that size. And wow a bat inside. 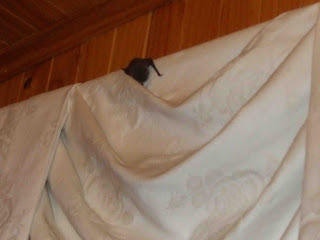 I have only seen bats when I was holidaying up north in Queensland. Just a tad envious of the butter dish. I am so glad you didn't freak out and kill the bat like so many would do. I am a "bat fan" LOL. Our school was having a problem with them getting in a while back and the administration had them slaughtered. How stupid.